Easy interior design tips: Here's how to nail six projects in a weekend. Why buy new when you can upcycle? These six weekend projects are truly inspiring. Let’s be honest, as the weather gets cooler and the days are filled with more drizzle, it can be easy to give into the temptation to become a homebody and spend most (if not all) of winter wrapped in a doona while cradling a cup of tea. That’s why if you fancy yourself a bit of a DIY-er, winter is the perfect time to get stuck into some projects around the home. Don’t worry, you don’t have to be an interior designer or have oodles of time up your sleeves to transform your living space. All that scrolling on Pinterest and Instagram needs to be put to good use, right? 1. Create a DIY chalkboard feature. There&apos;s nothing that screams "modern" quite like a DIY chalkboard. Image: Supplied. There&apos;s nothing that screams "modern" quite like a DIY chalkboard. Aside from looking super cool in a kid&apos;s bedroom, it&apos;s also a design feature that has some functionality to it. For the kids, it&apos;s perfect for playtime alone or a play date with their friends. If your child also draws on the walls anyway, it makes the cleanup much easier (thank heavens). For adults, a DIY chalkboard is a great addition to the kitchen for all those shopping lists and keeping on top of yours and your children&apos;s schedules. 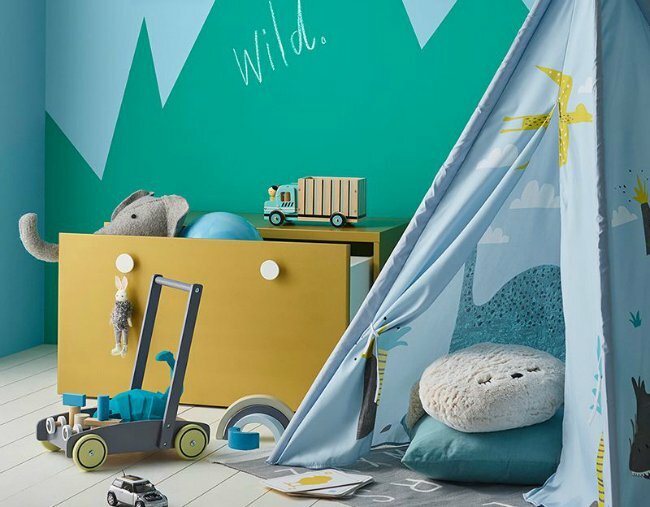 If you want to combine the chalkboard with a bit of design, try the chalkboard mountain feature from Dulux&apos;s Winter Projects Guide for an extra trend feature for a kids&apos; bedroom (pictured above). Dulux Design Effects Coloured Chalkboard paint comes in a range of chalkboard colours, so it&apos;s nothing like the chalkboard you think of in a classroom. Plus, you can use on items other than walls - like drawers for kids&apos; toys and clothes. For the how to, click here. 2. Make the kids&apos; toy box extra special. Because even toys deserve a special home! Image: Supplied. Now that you&apos;ve got the DIY bug after mastering the chalkboard, it&apos;s time to look at your kids&apos; toy box. As toy boxes go, they can show their wear over time (thanks, kids). But by turning your child&apos;s toy box into a gold one, not only are you saving money but you&apos;re making it extra special in the process. Place it at the end of the bed, and it&apos;s a focal point in your child&apos;s bedroom. So how can you achieve that Midas Touch effect? Try Dulux Design Effects Gold Effect, which lets you make the design your own with either an even one dimensional finish, a flat finish or a textured finish. Because even toys deserve a special home! 3. Make your bedhead look brand new. Bed heads can really add to the design element of your bedroom. Image: Supplied. If you&apos;ve ever had to buy a bedroom suite, you know they can be ex-pen-sive. If your bed could do with a bit of an update, go one step further to bring it up to date instead of getting a new doona and some colourful cushions. One word: bedhead. Yes, transforming the bedhead can make it look like it came straight from a furniture shop. Brand new, of course! Bed heads can really add to the design element of your bedroom, especially when they are done well. Using Dulux Duramax Chalky Finish Effect you can turn your bed head into a stylish feature of your bedroom and make it pop even more by adding a feature wall behind it. New bed, here you come. 4. Revamp your work space with a drawer and desk update. The answer is all in the drawers. Image: Supplied. Sometimes a fancy new mug or a new photo frame on your desk can be just what you need to motivate you in your home office. But what if you need a little more inspiration? It&apos;s a lot easier than you might think - the answer is all in the drawers. You can an make old worn-out set of drawers modern again using Dulux Design Effects or Dulux Aquanamel in your chosen colours. To take things to the next level, you could update your desk in the same colour to set aside your dedicated work space and place your desk and drawers next to each other. If you prefer a patchwork look, you could go for contrasting colours and make your work space a colour feast for the eyes. 5. Spruce up your vases with some rose gold metallic or marble effect. Rose gold gives gorgeous pops to any room. Image: Supplied. Why splash your cash on a new vase when you can just update an existing one? Dulux have a great range of spray paints such as rose gold metallic and marble effect, which can quickly turn a dull old vase into a chic new one. Rose gold gives gorgeous pops to any room, while using the marble spray paint can seriously upgrade an old vase into something more luxe and bespoke. The best part is it takes almost no time at all so you can spend your weekends admiring instead of working. We like the sound of that. 6. Transform your shelves into a glossy feature. Don&apos;t underestimate the power of a good glossy shelf to spruce up any room. Image: Supplied. As they&apos;re used to hold our many things, shelves can often feel like an afterthought to the retro photos, books, or vases filled with flowers that sit on top of them. But don&apos;t underestimate the power of a good glossy shelf to spruce up any room. If you&apos;re after more than just a bit of gloss you can turn your current shelves into a real key element of any room by adding some vibrant colour. You can spray the shelf with light, glossy coats so they stand out against the wall. Or if you&apos;re more adventurous, give a shelf a new colour altogether and make it pop with bright accessories so it&apos;s an immediate eye-catcher when you enter the room. So whether you&apos;re looking to make a kid&apos;s bedroom more exciting, revamp some pieces likes your vases and shelves, or going for something more specific like updating some drawers or a bedhead, they&apos;re all projects you can easily knock over in a weekend. This content was created with thanks to our brand partner, Dulux. What project are you going to do around the home this winter? Tell us in the comments section below. Dulux is focused on inspiring, guiding and providing solutions to all Australians for their painting projects. Being confined indoors during the winter months, exacerbates the #1 reason to take on a painting project – wanting a fresh look within your home. Because we all have that room that we are not proud of! Winter is the perfect time to complete those interior projects you’ve been meaning to do. And Dulux has the perfect guides to help you get started. What are you waiting for!